오설록이 ‘고객 경험’에 초점을 맞춘 다양한 서비스와 프로그램으로 새로운 티 하우스 모델을 제시하였습니다. Young 하고 Casual 한 Tea 카페에서 이제는 전문성 있는 티 브랜드 숍이자 오설록의 Origin 인 제주 헤리티지가 느껴지는 공간이 되었습니다. 또한 오설록 티 하우스 국립현대미술관점은 다양한 차를 마시고, Tea ceremony 서비스를 체험할 수 있습니다. 정성스럽게 만든 다양한 종류의 차와 제품들을 고객들이 여러 방법으로 경험해 볼 수 있도록 시향과 시음, 미니 티 클래스 등을 할 수 있는 공간을 마련하고, 또 그것들을 체험할 수 있는 다양한 서비스 툴을 새롭게 개발하였습니다. 또한 파사드, 의자, 테이블, 벽장 진열대, 매대 등 하나하나의 요소마다 제주의 헤리티지가 느껴질 수 있는 형태와 색감, 재질 등을 사용하였고, 소박하고 넘치지 않는 제주의 모습을 닮은 공간을 나타내고자 하였습니다. 오설록 브랜드의 모든 것에는 제주, 그리고 그곳에서 정성스럽게 키운 차(茶)와 그 문화를 담고 있습니다. 오설록의 심볼에는 제주의 바람, 다원(차 밭)과 한라산, 그리고 찻잔의 형상을 담고 있으며, 한글 로고에는 제주의 돌담 길과 바다에 떠오른 해를 나타내고 있는 것이 그 대표적인 예입니다. 제주 오설록 차 밭의 자연스러운 곡선이 겹쳐진 형태들은 새로 출시될 제품의 패턴과 포장지, 매장의 파사드에서도 볼 수 있습니다. 제주는 바람의 섬으로, 모든 형태들이 바람에 의해 만들어져 자연스럽고 완만합니다. 깎이고 쌓인 자연의 모습에 주변의 돌들을 듬성듬성 쌓아 나무를 걸치고, 천이나 줄을 엮어서 날아가거나 쓰러지지 않게 바람에 적응하며 지내는 지역적인 특징을 가지고 있으며 이를 모티브로 공간 설계에 적용하였습니다. 돌담의 틈으로 보이는 제주의 풍경을 표현한 이미지 월, 정성스레 쌓은 돌탑에 무심한 듯 걸쳐놓은 나무 선반, 간결하고 소박하지만 기능적인 제주 공예의 지혜를 볼 수 있는 오설록 의자, 제주 전통 반닫이 형상의 집기와 수납장은 제주를 기반으로 하는 많은 브랜드들과는 다른 오설록 만의 모습이라고 할 수 있습니다. 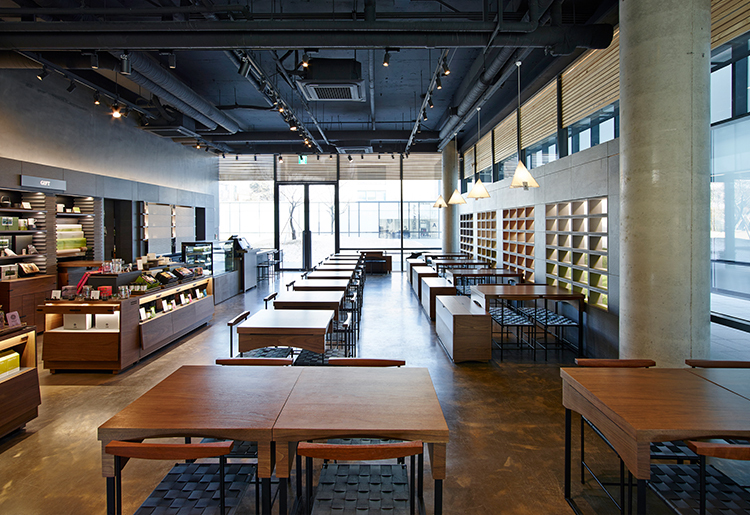 Osulloc suggested a new tea house model with diverse services and programs focused on “customer experience.” Starting out as a young and casual tea café, Osulloc is now a professional tea brand shop, an area resembling the heritage of Jeju, Osulloc’s origin. In addition, at the Osulloc Tea House of the National Museum of Modern and Contemporary Art, one can drink various kinds of tea and experience tea ceremony services. We created areas for scent tests, tea tasting, and mini tea classes wherein customers can experience diverse types of sincerely made tea and products, aside from developing diverse service tools through which customers could experience them. We also used forms, colors, and material of facades, chairs, tables, display wall stands, and other stands that resembled the heritage of Jeju. We made an effort to express an area resembling the artless and austere characteristic of Jeju. 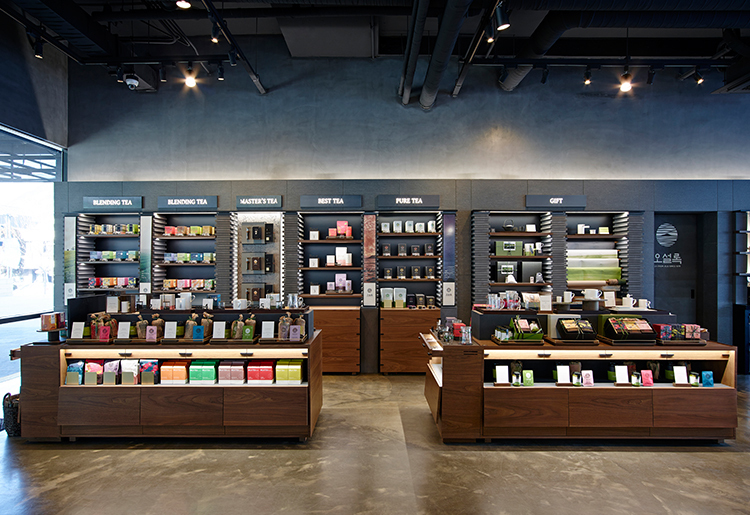 Every part of the Osulloc brand reflects Jeju and its sincerely made tea and culture. The symbol of Osulloc consists of the wind of Jeju, tea field and Hallasan Mountain, and shape of a tea cup. For instance, the stonewall walkway and rising sun of Jeju are depicted in the Korean logo. The naturally overlapped curves of the Osulloc tea field in Jeju can be found in the patterns and wrappers of the soon-to-be released new items and each store’s facade. Jeju is an island of wind, where all shapes are natural and gentle as they are formed by wind. As its regional characteristic, the residents piled stones as tall as trees in the image of the cut and accumulated nature, adjusting themselves to the wind by tying with cloth or rope. We applied this motif in the space design. The image wall that expressed the Jeju landscape as seen through the gap in the stone wall, the wooden rack artlessly draped on the carefully built stone tower, the Osulloc chairs that show the wisdom of Jeju craft with its simple and austere but functional aspect, and the furniture and cabinets in the shape of traditional Jeju cedar all demonstrate the unique image of Osulloc, differentiated from many other brands and based on Jeju.